The Best Business Law Blogs from thousands of top Business Blogs in our index using search and social metrics. Data will be refreshed once a week. Business Law newsletter is a comprehensive summary of the day's most important blog posts and news articles from the best Business Law websites on the web, and delivered to your email inbox each morning. To subscribe, simply provide us with your email address. Nashville, TN About Blog Strictly Business is a business law blog for entrepreneurs, startups, venture capital, and the private fund industry. The auther Alexander J. Davie, is a corporate & securities attorney based in Nashville, Tennessee, focusing on startups, technology, venture capital, M&A, and private fund work. San Diego, CA About Blog San Diego Corporate Law is a corporate attorney service for corporate, securities, contract, and intellectual property law for small and medium businesses. Facebook fans 1,215. Twitter followers 3,012. About Blog This blog is hosted by Ross & Shulga PLLC, a New York City-based corporate and securities law firm. The posts are all related to business law. About Blog A Global Resource for Compliance Officers & Legal Advisors offers updates on international compliance law. Facebook fans 886. Twitter followers 9,069. About Blog The Blog features posts on private law topics such as including contracts, torts, property, intellectual property, remedies, restitution, and more. About Blog The IBLJ’s twin goals are to provide readers with information and analysis on recent developments at the intersection of business and law and to give authors a creative and analytical outlet for legal areas that interest them. About Blog Journal of Intellectual Property and Entertainment Law (JIPEL) with the goal of encouraging scholarly discourse between academics, practitioners, and students interested in intellectual property and entertainment law topics. About Blog The Patent Law Practice Center is a destination point for patent practitioners to get the latest news, analysis and resources to assist them in their daily work. Facebook fans 1,488. Twitter followers 1,371. Oxford, England About Blog The Oxford Business Law Blog (OBLB) is a forum for the exchange of ideas and the reporting of new developments in all aspects of business law, broadly defined. Facebook fans 1,560. Twitter followers 1,014. About Blog Information about contract prof law blog. Sydney, Australia About Blog LawPath provides simple, effective legal solutions for small to medium businesses and consumers. Facebook fans 3,044. Twitter followers 2,050. UK About Blog You can find market trend reports, the latest legal updates and other carefully selected items, written by our team and with contributions from an extended group of leading experts and industry commentators. Seattle & Beijing About Blog Authored by Dan Harris and Steve Dickinson of Harris Bricken China Law Blog discusses Chinese law & how it impacts business in China. Their aim is to assist businesses already in China or planning to go into China, not to break new ground in legal theory or policy. Facebook fans 22,155. Twitter followers 255. Facebook fans 209. Twitter followers 1,363. About Blog A global leader in expert solutions, we help our customers make critical decisions every day in the health, tax, accounting, finance and legal sectors. Facebook fans 21,406. Twitter followers 11,530. Australia About Blog Australian law academic specialising in competition (antitrust) law. Facebook fans 435. Twitter followers 1,071. About Blog Stay informed on Intellectual Property law & developments. Sydney I Melbourne I Brisbane I Canberra About Blog A successful Law firm discussing everything related to corporate law for Australians. Facebook fans n/a. Twitter followers 3,713. UK and Dubai About Blog First UK commercial law firm to float on the London Stock Exchange, offering solutions-driven, flexible and commercial legal advice. Facebook fans n/a. Twitter followers 2,820. SiliconValley & the wilderness About Blog Because Law Can Be Used for Good. Facebook fans n/a. Twitter followers 14,388. Facebook fans 287. Twitter followers 16,194. Los Angeles, CA About Blog Understanding the legal challenges and implications surrounding consumer product law. Sunshine Coast, Queensland About Blog We are debt lawyers who specialise in business debts, unpaid invoices, corporate debts, unpaid loans, Magistrates Court, small claims QCAT, personal debts, enforcing money orders, letter of demand, statutory demands, insolvency, liquidation, and bankruptcy. Facebook fans 34. Twitter followers 132. About Blog Personal blog on Vietnam business law and practice . About Blog I am a Canadian competition and advertising lawyer with significant experience counseling companies, associations, agencies, governments and other organizations on the application of Canadian competition and advertising laws. North Carolina, USA About Blog The Forrest Firm provides full-service corporate legal resources in a manner that is unique and creative to the industry. Facebook fans 1,088. Twitter followers 1,426. Detroit, MI About Blog Dalton & Tomich attorneys are experts in land use, zoning and business legal matters. About Blog A Premier Litigation Firm, Providing Strategies And Solutions In The Changing Landscape Of Commercial Law. Detroit, MI About Blog Bejin Bieneman PLC is a full-service intellectual property law firm with seasoned patent and trademark prosecutors and litigators. Washington, DC About Blog On the Export Law Blog, Clif Burns provides latest news on DDTC, BIS, OFAC, and other export law matters. Mr. Burns is a Bryan Cave LLP attorney specializing in export control and economic sanctions. Montréal About Blog Business law firm in Montreal offering innovative legal solutions to better advise and protect your business. Multi-service law firm offering innovative legal solutions to better advise and protect you and your business. About Blog To provide intellectual property protection and patent services that are innovative and of exceptional quality. Los Angeles, CA About Blog Our Los Angeles, California blog deals with Business Law and related issues. Facebook fans 3. Twitter followers 21. About Blog This blog is about EU competition law developments and commentary. Africa About Blog News & Analysis of competition-law developments from the Leading African Antitrust Resource. About Blog Intellectual Property, Technology, Litigation & Business Law. We are copyright & trademark attorneys, a law firm specializing in trade secrets and intellectual property litigation. Facebook fans 45. Twitter followers 94. London About Blog The core value ensures that all members of our firm place a huge emphasis on understanding and achieving our clients’ objectives and delivering commercially focused legal solutions in the most cost effective manner. About Blog At the Omni Legal Group, we pride ourselves on counseling clients on the forms of protection that best suit their objectives. We then utilize Patent, Copyright, and Trademark law to secure their rights. Facebook fans 1,236. Twitter followers n/a. About Blog In 1709 (or was it 1710?) the Statute of Anne created the first purpose-built copyright law. This blog, founded just 300 short and unextended years later, is dedicated to all things copyright, warts and all. About Blog This blog by Welbaum Guernsey discusses legal information on the topic of Business & Commercial Law for Miami residents. Coral Gables, FL About Blog The Campbell Law Group focuses on all aspects of business law for Miami and South Florida businesses. Facebook fans 268. Twitter followers 28. About Blog Making Sense of All Things Legal, Particularly in the areas of Business and Real Estate. About Blog Our Wilkes-Barre, Pennsylvania blog deals with Business Law and related issues. Ottawa About Blog Woods, LaFortune LLP is a Canadian trade law boutique focusing on international trade, customs, government procurement and government relations. San Francisco, CA About Blog Intellectual Property Law Blog Thoughts and Ideas. About Blog At Costello Law Corporation, we are in the business of protecting your ideas. We have the experience and resources to assist you in any intellectual property matter, including issues with patents, copyrights, trademarks and trade secrets. About Blog Weblog about just European patent law: EPO case law, possibly also about the unitary patent. About Blog Web Resource on Corporate Law by Sunil Arya. About Blog Articles on international competition law. About Blog Suzanne Rab is a barrister specialising in EU and competition law. This is her blog on current developments in the competition law and regulatory world. About Blog At ConductLaw, we create legal solutions for you and your business that strike the right balance for you and your family. Portsmouth About Blog My areas of focus are company law and corporate governance, although I have interests in most areas of business law. About Blog Matilija Law is a Ventura CA based law firm specializing in business and corporate matters. Clients range from individuals to medium sized companies. About Blog Our corporate blog provides news and commentary for entrepreneurs with start-up and early-stage companies to middle market private and public companies. About Blog This Corporate Law Blog is for business owners, aspiring entrepreneurs, start ups and their advisors. Whether you are incorporating a company, restructuring your company, selling your business, buying a business, or anything in between – this blog is for you. Bakersfield, CA About Blog KernCounty's premier Litigation, Real Estate, Business, Estate Planning and Oil & Gas law firm representing clients throughout Bakersfield and the CentralValley. About Blog This blog by The Deneau Law Firm is geared toward Tempe, Arizona residents interested in news and information on the topic of Business Law. About Blog Maryland Business Law Developments provides a resource covering judicial developments in Maryland business law. The Woodlands, TX About Blog Boltz Law is dedicated to providing prompt, seasoned expert advice and guidance in legal matters involving business law, real estate law, wills, trusts, and probate law. Facebook fans 44. Twitter followers 38. About Blog The Daniel S. Willard, P.C. blog shares Business & Commercial Law stories and opinions relevant to Bethesda, Maryland residents. 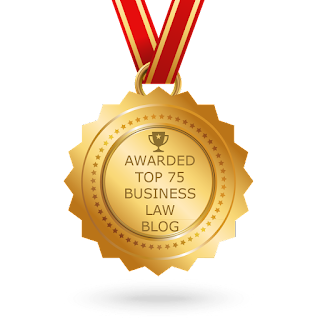 CONGRATULATIONS to every blogger that has made this Top Business Law Blogs list! This is the most comprehensive list of best Business Law Blogs on the internet and I’m honoured to have you as part of this! I personally give you a high-five and want to thank you for your contribution to this world.